As promised by the Joint Admission And Matriculation Board (JAMB), the portal for candidates to determine the institution they have been posted for 2016 admission has been enabled. Candidates can actually check the institutions they have been posted for 2016 admission. The portal is yet to be made official on its website, which goes to show that the candidates details are still being uploaded. So if you check and it does not display your details, you can always check back. 2. 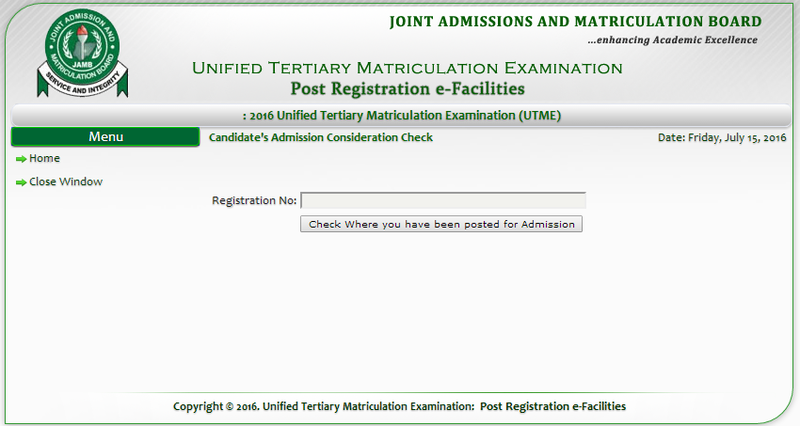 On the page that opens, enter your JAMB Registration Number in the space provided. Please re-share the post to your friends, it will help them alot. If you encounter any problem, please use the comment box below to let us know.